As lighting technology advances , so does the information needed to fully understand the new capabilities and possibilities. We know from our experience you don’t learn EVERYTHING there is to know about LED lighting overnight. To help you gain a quicker and more thorough understanding, we have compiled some of the most frequently asked LED lighting questions and provided the answers. If you don’t find the answer you’re looking for, contact Energy Efficiency Pros and we will be glad to answer any questions and help you learn the best methods and most efficient ways to light up your business. Do LEDs provide high-quality lighting? Can I Dim LED LEDs? LEDs offer the potential for cutting general lighting energy use nearly in half by 2030, saving energy dollars and carbon emissions in the process. Their unique characteristics include: Compact size, long life and ease of maintenance, resistance to breakage and vibration, good performance in cold temperatures, lack of infrared or ultraviolet emissions, and instant-on performance are beneficial in many lighting applications. The ability to be dimmed and to provide color control are other benefits of LED lights. One of the defining features of LEDs is that they emit light in a specific direction. Since directional lighting reduces the need for reflectors and diffusers that can trap light, well-designed LED fixtures can deliver light efficiently to the intended location. In contrast, fluorescent and “bulb” shaped incandescent lamps emit light in all directions; much of the light produced by the lamp is lost within the fixture, reabsorbed by the lamp, or escapes from the fixture in a direction that is not useful for the intended application. For many fixture types, including recessed downlights, troffers, and undercabinet fixtures, it is not uncommon for 40 to 50% of the total light output of fluorescent and incandescent lamps to be lost before it exits the fixture. Two aspects of energy efficiency are important to consider: The efficiency of the LED device itself (source efficacy), and how well the device and fixture work together in providing the necessary lighting (luminaire efficacy). How much electricity is used to provide the intended lighting service depends not only on the LED device, but also on the lighting fixture design. Because they are sensitive to thermal and electrical conditions, LEDs must be carefully integrated into lighting fixtures. The efficiency of a poorly designed fixture that uses even the best LEDs will be only a fraction of what it would be if the fixture were well-designed, and the design can also affect lumen maintenance. Learn more about LED energy efficiency. Energy performance of white LED products continues to improve rapidly. DOE’s long-term research and development goal calls for cost-effective, warm-white LED packages producing 224 lumens per watt by 2025. This chart shows typical luminous efficacies for traditional and LED sources, including ballast losses as applicable. Color appearance is communicated using correlated color temperature (CCT) on the Kelvin (K) scale. For most interior lighting applications, warm-white (2700K to 3000K) and in some cases neutral-white (3500K to 4000K) light is appropriate. Cool-white LEDs with very high CCT (bluish in appearance) tend to offer higher efficacy at low cost, but may not meet user expectations for color. 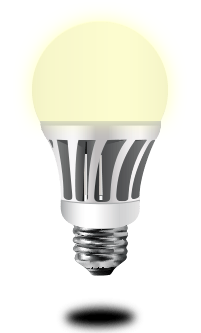 An increasing number of high-efficacy LED products are available in warm-white or neutral-white colors, to the point where many have surpassed CFLs. Two light sources with identical CCTs can render object colors very differently due to the differences in spectra. While CCT provides an indication of whether a light source may appear yellowish or bluish in color, Duv is an additional metric that can help identify sources with excessively greenish or pinkish hues. Color rendering, or color rendering index (CRI) measures the ability of light sources to render colors, compared to either incandescent reference sources if warm in color, or daylight reference sources if cooler in color. The leading high-efficiency LED manufacturers now claim a CRI of 80 or higher for phosphor-converted, warm-white devices. In general, a minimum CRI of 80 is recommended for interior lighting, with CRIs of 90 or higher indicating excellent color rendering. The CRI has been found to be inaccurate for RGB (red, green, blue) LED systems because it’s poor at predicting the quality of the appearance of saturated color objects, and doesn’t correspond well to human perception of color quality. As a supplement to CRI, a lamp’s R9 value describes how closely it renders a saturated red color sample, relative to the reference illuminant. CCT and CRI together only get you in the ballpark for selecting and matching lamp colors. A number of new color-rendering metrics have been proposed in recent years, but none have been widely adopted as of yet. In the meantime, color rendering of LED products should be evaluated in person and in the intended application if possible. Unlike other light sources, LEDs usually don’t “burn out”; instead, they get progressively dimmer over time (a process called lumen depreciation). LED useful life is typically based on the number of operating hours until the LED is emitting 70 percent of its initial light output. Good-quality white LEDs in well-designed fixtures are expected to have a useful life of 50,000 hours or even longer, all the way up to 100,000 hours! A typical incandescent lamp lasts about 1,000 hours; a comparable CFL lasts 8,000 to 10,000 hours, and the best linear fluorescent lamps can last 50,000 hours.A primary cause of lumen depreciation is heat generated at the LED junction. LEDs do not emit heat as infrared radiation like other light sources, so the heat must be removed from the device by conduction or convection. Thermal management is arguably the most important aspect of successful LED system design. Costs of LED lighting products vary widely. Good-quality LED products currently carry a significant cost premium compared to standard lighting technologies. However, costs are declining. It is important to compare total lamp replacement, electricity, and maintenance costs over the expected life of the LED product. Yes, you can dim LED with a standalone dimmer or using our dimmer and driver in one. All of our LED Lighting products are safety agency listed. LED lights are 50-85% more energy-efficient, have longer life, are more durable and require less maintenance. They contain no mercury and emit no CO2, making them environmentally friendly. LED lights come on instantly, even in cold weather, and are easily controllable, dimmable and offer better quality light. Efficacy is expressed in lumens per watt, where efficiency is expressed in a percentage of the LED efficiency. Light fixture efficiency is the ratio of the total lumens exiting the fixture to the total lumens initially produced by the light source. For example, if a bare 100W incandescent bulb produced 1,000 lumens and it is put into a fixture that delivers 700 lumens, it would be a 70% efficient fixture. Efficacy is a term used where the input and output units differ. In lighting, we are concerned with the amount of light (in lumens) produced by a certain amount of electricity (in watts). Efficacy = lumens per watt.